Egypt’s former assistant foreign minister for Arab Affairs, Ahmed al-Quesni, said Cairo could intervene in neighboring Libya militarily to safeguard its own national security and stability. “Egypt will not let the oil ports be taken away from the Libyan people” and the deployment of Egyptian troops will send a message to “Western countries” forcing them to “think twice before intervening” in the war torn country, Ahmed al-Quesni said in an interview with Alwasat. Quesni’s remarks hint that the Egyptian air force might have intervened in Libya after several reports talked of unidentified warplanes bombing troops battling renegade Field Marshall Khalifa Haftar who took over the control of the major oil ports in the country from the Petroleum Facilities Guard led by Jadhran this month. 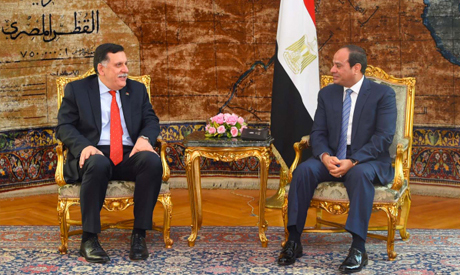 The former senior official said a probable Egyptian intervention would be focused on securing the borders through air surveillance, monitoring military operations and securing Libyan sea ports. The GNA has ruled out foreign intervention in the country although several western countries have some troops on the ground. “As a Presidential Council we are open to all political factions … I have no reservations. Anything that helps solve the Libyan crisis and that can open bottlenecks is welcome; we are ready to meet anyone,” Serraj stated. The GNA cabinet failed to get the vote of confidence of the Tobruk-based parliament as required by the Libyan Political Agreement. Written by: Peter Mulvany on September 26, 2016. Posted by Peter Mulvany on Sep 26 2016. Filed under Headlines, World News. You can follow any responses to this entry through the RSS 2.0. Both comments and pings are currently closed.